According to Section 2(13) of the CGST Act, 2017 “Audit” means the examination of records, returns and other documents maintained or furnished by the registered person under the GST Acts or the rules made there under or under any other law for the time being in force to verify the correctness of turnover declared, taxes paid, refund claimed and input tax credit availed, and to assess his compliance with the provisions of the GST Acts or the rules made thereunder. By a Chartered Accountant or a Cost Accountant based on turnover of the assesse during Financial year. Special Audit by Chartered Accountant or a Cost Accountant during assessment proceedings and based on complexities involved in books of account of assesse. Audit AdvantagesAssessee – Normally, the tax department conducts an audit or assessment after the close of a financial year. It is customary to expect that the departmental audit / assessment is conducted after the close of the financialyear except in cases where investigations, inspections or special audits are taken up. Naturally, any levy of additional taxes either due to non-compliance or incorrect comprehension of the complex tax laws would result in taxes plusconsequential interest and penalty. GST being a tax on supplies, would tend to wipe out the top line in such cases. Given the time lag between the date of committing an error and the date of ascertaining / rectifying such error, the consequence in such situations can be quite alarming in as much as the very liquidity of an entity can be under jeopardy. This would be the scenario, even where there is no mala fide intent on the part of the assessee to evade or avoid taxes that are legally due to the Government. Consequences that can arise in respect of issues that arise onaccount of classification or interpretation or judicial pronouncements can be disastrous. It is a basic fact, that no assessee would be in a position to collect such additional tax levies from customers long after the transaction stands closed. On the other hand, there may also be cases where eligible credit may not havebeen availed, and it cannot be claimed at a later date since it is either time barred or claims have not been preferred through the returns. Therefore, where a review is undertaken periodically, the discrepancies will be noticed at the time of omission / commission and corrective measures can be taken in a timely manner. Thus, it would lead to maximization of creditavailment and minimization of tax / other outgoes owing to proper planning and timely compliances. Audit AdvantagesGovernment – The tax department / Government would also stand to benefit from a periodic review by way of receipt of information that are duly classified, correct determination of total and taxable turnovers, reviewof rates of taxes, proper application of relevant notifications, circulars, clarifications, Government orders and adherence to the tax compliances. The audit report would also take into cognizance the relevant judicial precedents that are applicable to the registered person. Unlawful claims for benefits / unethical tax management practices adopted by the assessees would be filtered out, since tax professionals would intimate and persuade the assessees of theconsequences of such practices, and also bring out the discrepancies in their reports. When audits are performed by tax experts, the time spent by the taxauthorities on the scrutiny would be minimized, thereby allowing them to utilize the available time for more meaningful and productive purposes. Voluntary compliances by the assessee would encourage the department / Government tosimplify the law and procedures and develop a mechanism for ease of doing business. It would be a win-win situation. Audit Advantages Professionals – Tax Professionals are compelled to conclude the audits (mandated by statutes) in a time bound manner within a fixed period of time. However, where auditees engage them to carry out periodic reviews voluntarily, the said tax professionals will be in a position to deploy experts and spend adequate time and efforts, in order to go through the records and documents in detail. This will help them to better understand the operations of the auditee,resulting in value addition. Instead of carrying out the audit at the end of the year, for all the assessees, a periodic audit will help the auditee in understanding the short-comings that can be duly adhered to within time and would, in a way, avoid any further consequences. Every registered person whose turnover during a financial year exceeds the prescribed limit shall get his accounts audited by a chartered accountant or a cost accountant.While submitting the audit report assessed shall also submit a copy of the audited annual accounts, the reconciliation statement under sub-section (2) of section 44 of CGST Act 2017 and such other documents in such form and manner as may be prescribed. As per Section 44(2) Reconciliation statement means, assessee has to reconcile the value of supply declared in the returnfiled for the financial year with the audited annual financial statement. Rule 80(3) of CGST Rules 2017 prescribed limit of 2 crore to conduct audit u/s 35. It is to be noted that though in Section 35(5) the term “turnover” has been used, it shall mean “aggregate turnover”. Which is defined as under Section 2(6) of the CGST Act/SGST Act: Aggregate Turnover” means the aggregate value of all taxable supplies (excluding the value of inward supplies on which tax is payable by a person on reverse charge basis), exempt supplies, exports of goods or services or both and inter-State supplies of persons having the same Permanent Account Number, to be computed on all India basis but excludes central tax, State tax, Union territory tax, integrated tax and cess. So, it can be said that while calculating turnover under Rule 80(3) turnover of all units of taxpayer to be considered even though these units located in different states. Section 44 talks about the filling of annual return by assessee on or before 31 December of following the such financial year for which returns was filled, so its implied that audit report u/s 35 has to be submit along with annual return. GST had been implemented on 01.07.2017 and the first financial year in the GST Regime ended on 31.03.2018. Thus, it goes without saying that GST Audit shall be conducted for the first time. As a result, plenty of preparation is required both on the part of GST Auditor and GST Assessee. Besides, it is worth adding here that in case of Statutory Audit and Tax Audit (u/s 44AB of the Income Tax Act), the main thrust of the auditor is on the financial records. On the other hand, the scope of GST Audit is wider than scope of audit under Income Tax Act, 1961.Resultantly, it shall become obligatory on the part of the GST Auditor to have clear and precise understanding of various provisions of GST Acts/Rules made thereunder [including various mandatory records to be maintained] requirements of reporting and source of information, understanding the nature of business of the concerned assessee. 1. GST Audit shall be new to everyone. Resultantly, a number of auditees who are required to be get their accounts audited may not have sufficient knowledge about the various applicable provisions of the GST Act(s)/Rules. Therefore, it becomes essential on the part of a Chartered Accountant or a Cost Accountant to inform the concerned auditees not only about the requirement of GST audit but also about the mandatory documents and other preparations to be done by them. 2. Confirm his eligibility to be the GST Auditor in accordance with provisions of Section 2(23) [which has defined the term “Chartered Accountant”]or Section 2(35) [which has defined the term “Cost Accountant”]. 3. Understand the requirements of records to be maintained and advise the client to maintain the accounts and records so required. 4. Prepare the detailed Audit Programmes well as List of Records to be verified. 5. Prepare a detailed questionnaire to understand the operations/activities of the auditee. 6. Special attention must be paid to transactions not appearing in the FinancialAccounts but having GST implications. 7. Prepare various Reconciliation Statements. In case of a company the appointment of the GST auditor shall be made by a resolution of the Board of Directors or by an officer of the company, if so authorized by the Board in this behalf. In case of a partnership firm or proprietary concern, the appointment can be made by a partner or the proprietor or a person authorized by the assessee. The acceptance of appointment by the proposed GST Auditor shall also be communicated in writing to the assessee. Since the GST Audit is applicable for the first time for the financial year 2017-18, requirement of communication with the previous GST Auditor shall not arise. However, it is quite possible that in the pre-GST Regime, some assessees may be subject to VAT Audit, which was undertaken by an eligible auditor. However, GST Audit of the same assessee for the year 2017-18 may be allotted to a different Auditor. Now, the question arises is whether the new GST Auditor is required to communicate with the VAT Auditor. It is opined that since GST Acts are separate and independent Acts and the Audit specified therein is different VAT audit, there is no need for the GST Auditor to communicate with earlier VAT Auditor, before taking up the GST audit. However, in the subsequent years, in case of change in the GST Auditor, the new auditor shall communicate with the previous auditor as per the provisions of the Chartered Accountants Act, 1949 or Cost and Works Accountants Act, 1959. General Checklist for a Chartered Accountant before Accepting the Appointment as an GST Auditor. 1. Any member in part-time practices not entitled to perform attest function. Only partners can perform attestation function. 2. In case of Joint Audits,all the auditors will have to sign the audit report. If the auditors have different opinion, then they should issue separate audit reports. 3. A chartered accountant having substantial interest in the assessee’s business cannot take up the audit. 4. A chartered accountant who is responsible for writing or the maintenance of books of accountof an assessee is not eligible for being appointed an auditor of the same assessee. 5. Internal auditor of an assessee cannot be appointed as his tax auditor. 6. A chartered accountant is not eligible to accept the GST Audit of a person to whom he is indebted for more than Rs. 10,000/-. 7. The restrictions applicable for appointment of statutory auditor where fee for other services are more than the statutory audit fee, in case of specified entities, is not applicable to GST auditors. 8. A chartered accountant cannot charge professional fees based on a percentage of profit or which are contingent upon the finding or the result of the professional employment. 9. In many cases, an assessee may be having his GST registrations in many States. The assessee may appoint single auditor for all his registered establishments. Accounts and records might have been kept in the local language of the State. It is suggested that in the normal course, the auditor should not accept the audit of accounts written in a language which he/his staff does not understand. Any resolution to remove a statutory auditor shall not be effective unless there are good and substantial grounds for the removal related to the conduct of the auditor with regard to the performance of his or her duties as auditor. However, the auditor cannot be removed on the ground that he has given an adverse or qualified Audit Report. In the event an auditor has been removed without any valid grounds, the Ethical Standards Board of ICAI or ICWAI, as the case may be, can intervene and it may direct the incoming auditor not to accept the audit assignment. Tax liability on supply of goods or services or both is computed by a registered person under self-assessment scheme of the Act. In order to ensure whether the tax liability has been correctly computed and discharged by the registered person, it becomes essential for the Department to conduct an audit of Records maintained by the person. The Commissioner or an officer authorised by him, may undertake audit of any registered person by issuing a general order or a special order. General Order shall specify the criteria and all the registered persons fulfilling that criteria shall get covered in the ambit of audit. On the other hand, Special Order for audit shall be issued in the name of a particular registered person and only such person shall be made subject to audit. Further, the authorised officer may conduct Audit either at the place of business of the registered person or in his own office. (ii) Furnish such information as may be required by him for the conduct of audit, and to provide assistance for timely completion of audit. It is also pertinent to add here that audit of a registered person shall be completed within three months from the date of commencement of audit. The expression ‘commencement’ shall mean the date on which the books of account, records and other documents, asked for by the tax authorities, are made available by the registered person or the date of actual institution of audit at the place of business, whichever is later. However, if the Commissioner is satisfied that audit of the registered person cannot be completed within three months, he may extend the time period for a further period not exceeding six months after recording the reasons for doing so in writing. Manner of Conducting Departmental Audit – Rule 101 of the CGST/SGST Rules, 2017. Audit of a registered person shall be conducted for a period of a financial year or multiples thereof. Thus, Audit cannot be conducted for a part of the Financial Year in normal circumstances. Period to be covered under the Audit can be a single financial year or two financial years or three and so on. The registered person shall also be informed by way of notice in FORM GST ADT-01 at least 15 days prior to the conduct of audit. Moreover, the proper officer who has been authorised to conduct the audit of the records and books of account of the registered person shall, with the assistance of his team of officers and officials, verify the documents on the basis of which the books of account are maintained, the returns and statements furnished by the registered person, the correctness of the turnover, exemptions and deductions claimed, the rate of tax applied in respect of supply of goods or services or both, the input tax credit availed and utilized, refund claimed, and other relevant issues and record the observations in his audit notes. Furthermore, the proper officer may inform the registered person of the discrepancies, if any, noticed. The registered person may file his explanation to discrepancies in his reply. Thereafter, the proper officer shall finalise the findings of the audit after due consideration of the reply furnished. Finally, on conclusion of audit, the proper officer shall, within 30 days, inform the registered person, whose records are audited, about the findings, his rights and obligations and the reasons for such findings in FORM GST ADT-02. If at any stage of scrutiny, enquiry, investigation or any other proceedings before him, any officer not below the rank of Assistant Commissioner, having regard to the nature and complexity of the case and the interest of revenue, is of the opinion that the value has not been correctly declared or the credit availed is not within the normal limits, he may, with the prior approval of the Commissioner, direct such registered person by a communication in writing to get his records including books of account examined and audited by a chartered accountant or a cost accountant as may be nominated by the Commissioner. The Chartered Accountant or Cost Accountant nominated by the Commissioner shall, within a period of 90 days from the date of his nomination, furnish the Audit Report to the Assistant Commissioner on whose direction audit is conducted. However, the aforesaid period of 90 days may be extended by the Assistant Commissioner on his own motion, or on an application made by the registered person or the Chartered Accountant or Cost Accountant nominated by the Commissioner, for material and sufficient reason. It is also worth highlighting here that even if the accounts and records of the registered person are audited under any other provisions of the CGST Act/SGST Act or any other law in force [such as Companies Act, 2013 or Income Tax Act, 1961], the said registered person shall be required to get his records audited by a Special Auditor. Thus, provisions of Special Audit have an Overriding Effect on other Audit provisions of the CGST Act/SGST Act or of any other Act. The Registered Person shall be given an opportunity of being heard where any material gathered on the basis of Special Audit under the CGST Act/SGST Act is proposed to be used against him in any proceedings under the Act as per the Principle of Natural Justice. The expenses of examination and audit of records of the Registered Person by the Special Auditor [including the remuneration of the Special Auditor] shall be determined and paid by the Commissioner. And aforesaid determination of expenses shall be final which means that no appeal can be filed to any Authority against such determination. It is also essential to note that if Special Audit of the records and documents of the Registered Person results in detection of tax not paid or short paid or tax erroneously refunded, or input tax credit wrongly availed or utilized by him, the proper officer may proceed to initiate action under Section 73 or Section 74 of the CGST Act/SGST Act. The Headings of foregoing Section 73 or Section 74 are given in the Table hereinbefore. Where special audit is required to be conducted under section 66 of CGST and SGST Act, the officer referred to in the said section shall issue a direction in form GST ADT-03 to the registered person to get his records audited by the chartered accountant or cost accountant specified in the said direction – Rule 102(1) of CGST and SGST Rules, 2017. On conclusion of special audit, the registered person shall be informed of the findings of special audit in form GST ADT-04. GST has been implemented with effect from 01.07.2017. As a consequence, during the financial year 2017-18, GST remained in force only for a period of nine months from 01.07.2017 to 31.03.2018. Now, the question which arises here, is whether the above-mentioned annual turnover limit of Rs. 2 crore for audit purposes shall apply proportionately in the given case for a period of nine months or whether the foregoing limit shall apply as it is for a period of nine months. A suitable and immediate clarification from the Government(s) is required in this regard. It is worth emphasizing here that for audit purposes the turnover limit of Rs. 2 Crore shall be computed by including turnover in all the States or Union territories, as the case may be, i.e. on all India basis under same PAN. Furthermore, the foregoing threshold turnover limit of Rs. Two Crore is same for assessees in all the States and Union Territories. Thus, it can be safely inferred that no separate threshold limit has been specified for Special Category States. Since each of the State GST Acts also has the provisions relating to GST Audit, it appears that the GST audit shall be conducted state-wise. It also appears that only for the purpose of determining the eligibility of the assessee who is required to get its accounts audited by a Chartered Accountant or a Cost Accountant, the all India based turnover shall be considered. However, it shall be better if a suitable clarification from the Government(s) is issued in this regard at the earliest. Audit has to be completed within a stipulated period of three months (subject to extension) from the date of commencement. ‘Commencement of audit’ shall imply that date on which the records and other documents, called for by the tax authorities, are made available by the taxable person or date of actual institution of audit at the place of business, whichever is later. The period of three months can be extended by six months for reasons to be recorded in writing. · proceed to determine tax and other dues under section 79 providing for recovery of dues. · Failing to collect tax or does not collect sufficient amount of tax as required from the supplier or fails to pay the tax collected to the government. · Supply of goods and services is carried without giving appropriate invoice or providing incorrect invoice. 1. First time offence – Extend to 10,000 rupees. 2. Continuing Offence – 10,000 rupees plus penalty which may extend to 100/- rupees per day subject to a maximum limit of 25,000 as per Section 124. The government’s support and intention to ensure that GST compliance is followed paved a way for application of penalties. The penalties can be partially or fully waived as the government reserves the right to do the same. As a whole, GST is aimed at bringing the complete nation under ambit of one tax. As they say, “Prevention is better than cure” it’s always a good practice to avoid penalties or prosecution that would contribute to achieve better transparency and compliance as per GST law. (g) shall prescribe manner of undertaking audit. Audit under section 65 of the GST Act, 2017 is a discretionary audit and shall be carried out only in cases where such audit of business transaction as is deemed proper, in the given set of facts and circumstances. The audits carried out or ordered under any order provision, i.e. section 35(5) or 66 of the GST Act, 2017 are mutually exclusive and these audits can be carried out on the auditee (registered taxable person) simultaneously. Further, each such audit has different objective. However, unlike section 66(3) dealing with special audit which contains a non-obstante clause, section 65 does not have any such over-riding provision. (d) Initiate action under section 73, i.e determination of tax not paid or short paid or erroneously refunded, if the audit results in detection of (i) tax not paid or short paid, or (ii) tax erroneously refunded, or (iii) input tax credit erroneously availed. As per section 65(6) of the GST Act, 2017, on conclusion of audit, the proper officer shall, within thirty days, inform the registered person, whose records are audited, about the findings, his rights and obligations and the reasons for such findings. Section 65 of the GST Act, 2017 only provides for audit of business transactions of a taxable person. Only when the audit results in detection of tax evasion or wrong input credit availed, proper officer may initiate action under section 73 of the GST Act, 2017.
a. Determination of tax not paid or short paid or erroneously refunded or input tax credit wrongly availed or utilized for any reason other than fraud or any willful misstatement or suppression of facts. b. Determination of tax not paid or short paid or erroneously refunded or input tax credit wrongly availed or utilized by reason of fraud or any willful-misstatement or suppression of facts. It may be noted that in Central Excise and Service Tax, Excise Audit and Service Tax audit was carried out by way of verification and scrutiny by audit Commissionerate, though there was no specific provision for audit by departmental officers. Rule 5A of Service Tax Rules, 1994 provides that commissioner or audit team of Comptroller and Auditor General of India can visit the assessee’s premises for audit purposes. If the turnover of any registered tax payer exceeds rupees 2 crore in a financial year, then he/she shall get his books of accounts audited by a CA or a Cost Accountant as per GST Rules. The annual return shall be filed electronically through Form GSTR 9B, along with the reconciliation statement, the audited statement of annual accounts and other documents as prescribed as per the GST law. If any error/mistake is noticed in any of the returns filed during the financial year while auditing the accounts, it can be rectified only in the annual return. For example, if any liability was missed to be reported in any of the months for the financial year, It has to be reported and paid along with interest at the time of filing the annual return pertaining to that year. Audit by a Chartered Accountant or a Cost Accountant. Ø Section 2(1)(b) – a “chartered accountant” means a person who is a member of the Institute. Ø Section 2(2) – a member shall be deemed to be in practice if he engages himself, for a consideration, in the specified activities, which includes inter alia audit. Ø Section 6 provides that a member cannot practice without obtaining Certificate of Practice. · Internal auditor of an assessee cannot be appointed as his tax auditor (281st Council Meeting Resolution). · In case of joint audits, all the auditors will have to sign the audit report and should issue separate reports where they have different opinions. (Ref SA 299). The restrictions applicable for appointment of a statutory auditor where fee for other services are more than the statutory audit fee, in case of specified entities, are not applicable GST auditors (Chapter IX of ICAI Guidelines). An assessee may have GST registrations in more than one State. In such cases, the assessee may appoint a single / multiple auditor(s) for the distinct registrations under the same PAN. It is possible that accounts and records thatare kept in different States may be in the local language of that State. In such cases, it is suggested that the auditor should not accept the audit of accounts written in a language which he / his staff do not understand. Annual Return: Every registered person [other than an input service distributor (ISD), person required to deduct tax at source (TDS), person required to collect tax at source (TCS), casual taxable person (CTP) and non-resident taxable person] shall furnish an annual return for every financial year electronically in the FORM GSTR-9 (composition suppliers in GSTR-9A and e-commerce operators in FORM GSTR-9B) on or before 31st December following the end of the financialyear. Where a registered person is required to get his accounts audited, such annual return shall be furnished along with the audited accounts. Reconciliation statement – Rule 80(3) provides that the reconciliation statement shall be furnished in the FORM GSTR-9C (format yet to be notified). The provisions of Section 44(2) require reconciliation of the figures declared in‘return furnished for the financial year’ with the ‘audited financial statement’. It appears that the return furnished for the financial year refers to the annual return furnished. During the course of the audit, any discrepancies found shall be corrected / rectified by declaring the correct turnovers in the annual returns. In this regard, it may be noted that the time limit for declaring the details of debit note/ credit note and for taking the input tax credit would lapse in September of the following year, whereas the annual return can be furnished by the end of December of the following year. Where any discrepancies are noted during thecourse of the GST audit post September, it appears that no recourse would be available to the auditee. There would be a challenge in the reconciliation process in case of large entities having registration in multiple States/UTs, since many transactions on which GST has an impact may not have direct visibility in the financial statements. E.g. Stock transfers, free supplies, distribution of free samples, gifts, transactions with related persons, supplies without consideration, goods sent on approval basis, supplies through agents, etc. The auditor must note that the reconciliation statement can be prepared only when the audited financial statements are made available. The law, however, does not explicitly provide that the reconciliation must be prepared between theaccounts audited by him and the annual return, in case of registered persons whose books of account have not been audited, say, in the case of non-company assessees. Every registered person shall maintain the details of input tax credit (ITC) availed, stock of goods – in value and quantity with description of inflow and outflow, production / manufacture of goods, inward and outward supplies ofgoods and/or services including imports and exports, supplies attracting tax on reverse charge, details of advances paid / received, output tax payable and paid, etc. along with the relevant documents such as invoices / bills of supply/ delivery challans / credit notes / debit notes / receipt vouchers / payment vouchers / refund vouchers. The registered person shall also maintain the names and complete addresses of suppliers and recipients, and the complete address of the premises where goods are stored (including goods stored during transit). Goods found at a placeother than so declared without a valid tax invoice could be treated as a taxable supply. Also, any record belonging to a registered person found at any premises other than those declared shall be presumed to be maintained by the saidregistered person unless proved otherwise. The details contained in the records are expected to be true and correct. Entries therein shall not be erased / effaced / overwritten, and all incorrect entries, otherwise than those of clerical nature, shall be scored out under attestation and thereafter the correct entry shall be recorded and where the registers. In case of electronically maintained records, a log of every entry edited / deleted shall be maintained. Such records are required to be maintained at the principal place of business (as appearing in the certificate of registration), and in case of additional places of business specified in the certificate, the records must be maintained in the respective places. The registered person is also permitted to maintain the records in electronic form. Every owner or operator of warehouse / godown / other storage spaces, and every transporter, shall maintain records of the consigner, consignee and other relevant details of the goods, even if he is not a registered person. A registered person supplying services shall maintain the accounts showing quantitative details of goods used in the provision of services, details of input services utilized and the services supplied. A registered person executing works contract shall keep separate accounts for works contract showing the names and addresses of the suppliers and the persons on whose behalf the works contract is executed, the details of description, value and quantity of goods or services received and utilized for the execution of works contract, the details of payment received. Where records are generated and maintained electronically, proper backup is to be maintained and preserved, and shall be authenticated using a digital signature. On demand by the officers, the registered person shall give the electronic record file with the password. In the absence of any prescribed format for reporting of information to be furnished after the audit, preparation of the GST audit program would not be complete. However, based on past experience in audits, and considering the applicable provisions of the GST laws, one can start preparing the audit program and finalise the same once the reporting requirements are notified. · Whether the other information given in the return is correct and complete. · Compliance with the conditions for availment of credits, proportionate credit availed, ineligible credit reversal, payment to suppliers, etc. · The major analytical ratios. Understanding the business of the auditee: The GST audit casts a huge responsibility on the auditor, and it is very important that the auditor is aware of the nature and complexity of the business / operations of the auditee. Whenan auditee approaches a Chartered Accountant for the first time, he must exercise due caution in assessing how compliant the auditee is, from a GST stand-point. It may be advisable that he prepares a suitable standard questionnaire (depending on the nature of business and facts and circumstances of each case) in order to become familiar with the business, modus operation of operation etc. It must also be noted that a long / complicated questionnaire may not be effective, even if prepared with a view to obtain a comprehensive understanding. The auditor may obtain a brief from the auditee on the questionnaire to get the best results. Special attention to transactions not appearing in the financial accounts: There are several transactions which may not appear in the financial accounts and records maintained by the registered persons such as stock transfers, freesamples, services received from outside India from related parties, other supplies made without consideration, etc. Due care must be exercised by the auditor to identify such transactions as there may be no direct reference tothese transactions in the financial records. Use of Software: The systems, processes and controls put in place by the business entity will largely define the scope of the auditor in conducting an audit, in assessing the risks of the audit as well as for planning the audit. It isimportant for auditors to be conversant with various software. Many a time, the islands of information do not talk to each other and present different values.Different software tools are available for conducting an audit, and the oneappropriate to the auditee must be chosen based on nature of the audit and size of the auditee. While selecting the software or software tool, the auditor must check on whether the same is updated with the latest amendments. Since the audit under the GST laws is being carried out for the first time, the auditor must be attentive to the possible errors that could arise while using the software. h. Transitional issues (law does address all types of transactions). n. Lastly, it is important to create an entity-level checklist with a view to ensure that all the transactions are adequately covered in the process of conduct of an audit. Q.1 Who is the person responsible to make assessment of taxes payable under the Act? Ans: Every person registered under the Act shall himself assess the tax payable by him for a tax period and after such assessment he shall file the return required under section 39. Q.2 When can a taxable person pay tax on a provisional basis? Q.3 What is the latest time by which final assessment is required to be made? b) by the Commissioner for such further period as he may deem fit not exceeding fours. Thus, a provisional assessment can remain provisional for a maximum of five years. Q.4 Where the tax liability as per the final assessment is higher than in provisional assessment, will the taxable person be liable to pay interest? Ans: Yes. He will be liable to pay interest from the date the tax was due to be paid originally till the date of actual payment. Q.5 What recourse may be taken by the officer in case proper explanation is not furnished for the discrepancy detected in the return filed, while conducting scrutiny under section 61 of CGST ACT? (d) Initiate proceeding for determination of tax and other dues under Section 73 or 74 of the Act. Q.6 If a taxable person fails to file the return required under law (under section 39 (monthly/quarterly), or 45 (final return), what legal recourse is available to the tax officer? Ans: The proper officer has to first issue a notice to the defaulting taxable person under section 46 of CGST/SGST Act requiring him to furnish the return within a period of fifteen days. If the taxable person fails to file return within the given time, the proper officer shall proceed to assess the tax liability of the return defaulter to the best of his judgement taking into account all the relevant material available with him. (Section 62). Q.7 Under what circumstances can a best judgment assessment order issued under section 60 be withdrawn? Ans: The best judgment order passed by the Proper Officer under section 62 of CGST/SGST Act shall automatically stand withdrawn if the taxable person furnishes a valid return for the default period (i.e. files the return and pays the tax as assessed by him), within thirty days of the receipt of the best judgment assessment order. Q.8 What is the time limit for passing assessment order u/s 62 (Best Judgment) and 63 (Non-filers)? Ans: The time limit for passing an assessment order under section 62 or 63 is five years from the due date for furnishing the annual return. Q.9 What is the legal recourse available in respect of a person who is liable to pay tax but has failed to obtain registration? Ans: Section 63 of CGST/SGST Act provides that in such a case, the proper officer can assess the tax liability and pass an order to his best judgment for the relevant tax periods. However, such an order must be passed within a period of five years from the due date for furnishing the annual return for the financial year to which non-payment of tax relates. Q.10 Under what circumstances can a tax officer initiate Summary Assessment? b) the proper officer believes that delay in passing an assessment order will adversely affect the interest of revenue. Q.11 Other than appellate remedy, is there any other recourse available to the taxpayer against a summary assessment order? Ans: A taxable person against whom a summary assessment order has been passed can apply for its withdrawal to the jurisdictional Additional/Joint Commissioner within thirty days of the date of receipt of the order. If the said officer finds the order erroneous, he can withdraw it and direct the proper officer to carry out determination of tax liability in terms of section 73 or 74 of CGST/SGST Act. The Additional/Joint Commissioner can follow a similar course of action on his own motion if he finds the summary assessment order to be erroneous (section 64 of CGST/SGST Act). Q.12 Is summary assessment order to be necessarily passed against the taxable person? Ans: No. In certain cases, like when goods are under transportation or are stored in a warehouse, and the taxable person in respect of such goods cannot be ascertained, the person in charge of such goods shall be deemed to be the taxable person and will be assessed to tax (proviso to Section 64 of CGST/SGST Act). Q.13 Who can conduct audit of taxpayers? Q.14 Whether any prior intimation is required before conducting the audit? Ans: Yes, prior intimation is required and the taxable person should be informed at least 15 working days prior to conduct of audit. Q.15 What is the period within which the audit is to be completed? Ans: The audit is required to be completed within 3 months from the date of commencement of audit. The period is extendable for a further period of a maximum of 6 months by the Commissioner. Q.16 What is meant by commencement of audit? Q.17 What are the obligations of the taxable person when he receives the notice of audit? 3. render assistance for timely completion of the audit. Q.18 What would be the action by the proper officer upon conclusion of the audit? Q.19 Under what circumstances can a special audit be instituted? Ans: A special audit can be instituted in limited circumstances where during scrutiny, investigation, etc. it comes to the notice that a case is complex or the revenue stake is high. This power is given in section 66 of CGST /SGST Act. Q.20 Who can serve the notice of communication for special audit? Ans: The Assistant / Deputy Commissioner is to serve the communication for special audit only after prior approval of the Commissioner. Q.21 Who will do the special audit? Q.22 What is the time limit to submit the audit report? Ans: The auditor will have to submit the report within 90 days or within the further extended period of 90 days. Q.23 Who will bear the cost of special audit? Q.24 What action the tax authorities may take after the special audit? 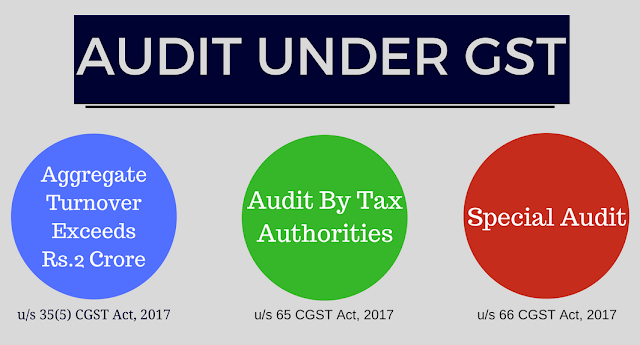 Ans: Based on the findings / observations of the special audit, action can be initiated under Section 73 or Section 74 of the CGST/SGST Act.